(Honolulu, HI)— The Essence of Hawai`i Photo Contest, part of PhotoCon Hawai`i, is drawing the attention of both contestants and sponsors—so much so that the entry cutoff date has been extended to August 31, 2017 (originally July 7, 2017). In addition, PhotoCon Hawai`i will host two additional workshops, courtesy of DJI (Dxxxxx Jxxxx Ixxxx). With the expertise of Mike Elliot of Drone Service of Hawaii, along with his team of drone experts, an Intro to Drones (for beginners) and Advanced Drones (for advance UAV pilots) workshops will be offered to PhotoCon attendees. An Early Bird Registration rate of $10 per day or, $15 for both days is available until Friday, July 21, 2017. Online registration will guarantee access to all KeyNote presentations and the Tradeshow. For those interested, register online at photoconhawaii.com/registration/. 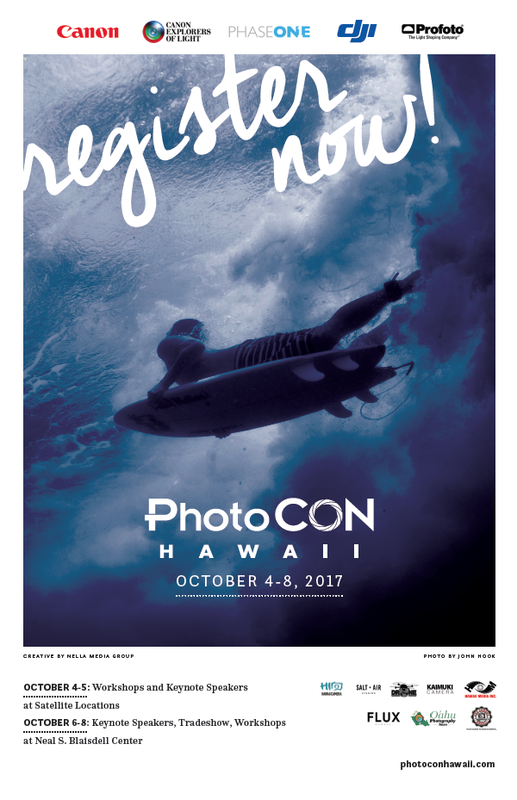 Those interested in exhibiting at PhotoCon Hawai`i are encouraged to contact exhibits@photoconhawaii.com. First, Second and Third place winners will receive prizes from Canon USA, DJI, Phase One, Hawaii Camera and Profoto. Winning images and runners-up along with a photographer bio and caption will be printed in the official PhotoCon Journal as well as in the Fall issue of FLUX Magazine (on newsstands from September through December 20, 2017). Winners are to be determined by a select group of industry experts through predetermined criteria. Images shot in Hawai`i during 2016, and 2017 are eligible for entry. Contest entries close on August 31, 2017. Ric Noyle will announce The Essence of Hawai`i Photo Contest winners on October 7, 2017. For more detail, visit photoconhawaii.com/call-for-entries/. Noteworthy workshops include Canon Food Photography featuring the culinary dishes by students of the Kapi’olani Community College Culinary program; Hawaii-based food stylist Karen Jones will coach workshop participants. Canon will also host workshops on printing, scanning, and tilt-shift lenses. PhaseOne will host a guest lecture by retouching expert Zac Henderson in CaptureOne, an advanced raw retouching and color corrections class. Dan Cuny of Profoto will hold a Flash workshop and demonstration in which students will learn the uses of flash in any situation. DJI and Drone Services of Hawaii will host a Drone Intensive Workshop. KeyNote Speakers will also host special workshops during the Tradeshow. For more information and updates on guest speakers, visit photoconhawaii.com/elements/speakers/. Hawaii’s local photo and video industry leaders will be among the exhibitors in attendance; of note is Hawaii Media Inc., Hawaii Camera, Salt+Air Studios, Drone Services Hawaii, Kaimuki Camera, Oahu Photography Tours, Pro Camera, Nella Media Group and FLUX Hawaii.